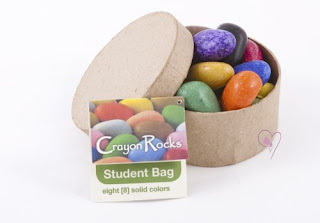 A new find that I am really excited about are Crayon Rocks from Mama.Baby.Love. They are all natural soy wax crayons made from USA grown soybeans and colored with natural mineral powders. Designed to strengthen the tripod grip muscles, they are used by occupational therapists to develop fine motor skills. They're recommended for children age 3 and up, however, because since they look like pebbles and are very attractive, they still pose a choking hazard to curious toddlers. So go over to Mama.Baby.Love and order these wonderful crayons for your kiddo, or as birthday or Christmas gift to budding artists. Check the other items too while you're there!